This tutorial expands on templated funnels to show how you can create your own funnel and path reports. These reports are powerful tools for analyzing the behaviors of your users. Funnel and path are available for Custom Events. Since most users are unable to complete a goal in a single session, our example funnel and path report shows goals achieved over a time range. Explore the Revenue funnel report. Run the the report again to see the path of users. Navigate to the Revenue dashboard. In the Funnel report pane, click the ellipsis icon and select Explore From Here. Click the arrow next to Filters to display the full menu. Edit the filters and values as desired, then click the Run button. In Funnel » Filter-only Fields, click the Filter button next to Event 2 and Event 3. 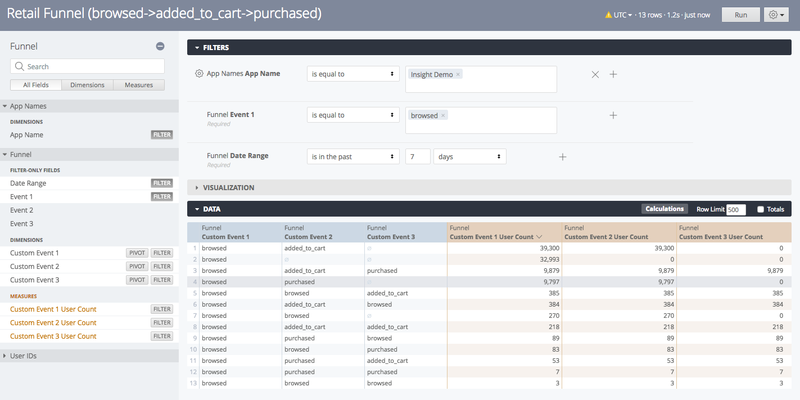 In Funnel » Dimensions, click the rows for Custom Event 1, 2, and 3.